Cat Neglect Warning! Graphic Photo. Killed by a Fan Belt - The Dying is Worse than the Death Warning! Graphic Photos. Head Trapped in a Jar - The Dying is Worse than the Death Warning! Graphic Photos. Is an arrow through the cheek a humane outcome? Is re-dumping the cat back to 'her' colony after this ordeal ethical or compassionate? As expected, there is outrage for the person who shot this cat. Where is the outrage for the folks who put her in this postion in the first place and are considering putting her at risk again after she recovers? Re-abandonment of domestic animals into 'managed' colonies is animal neglect and cruelty and should be considered a criminal act. Watch video at this news story. Video of an Ear-tipped Injured Feral Cat Warning! Graphic. 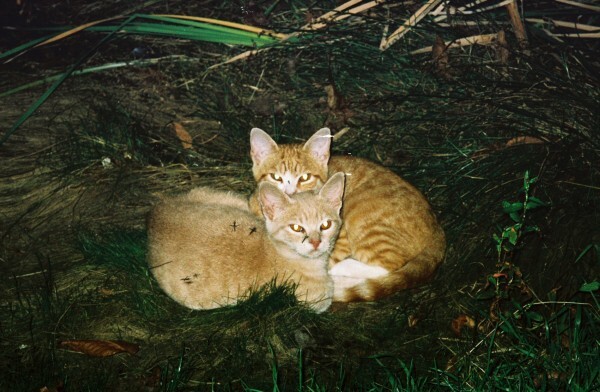 These mosquito-covered kittens were part of a "managed" colony. Click here for close-up of kittens.